The purpose of this study was to examine the effect of nutritionally enriched JavaFit™ (JF) coffee (450 mg of caffeine, 1200 mg of garcinia cambogia, 360 mg of citrus aurantium extract, and 225 mcg of chromium polynicotinate) on resting oxygen uptake (VO2), respiratory exchange ratio (RER), heart rate (HR), and blood pressure (BP) in healthy and physically active individuals. Ten subjects (8 male, 2 female; 20.9 ± 1.7 y; 178.1 ± 10.4 cm; 71.8 ± 12.1 kg) underwent two testing sessions administered in a randomized and double-blind fashion. During each session, subjects reported to the Human Performance Laboratory after at least 3-h post-absorptive state and were provided either 354 ml (1.5 cups) of freshly brewed JF or commercially available caffeinated coffee (P). Subjects then rested in a semi-recumbent position for three hours. VO2 and HR were determined every 5 min during the first 30 min and every 10 min during the next 150 min. BP was determined every 15 min during the first 30 min and every 30 min thereafter. Area under the curve (AUC) analysis was computed for VO2, whereas a session-average was calculated for RER, HR and BP. Initial analysis revealed no significant differences. 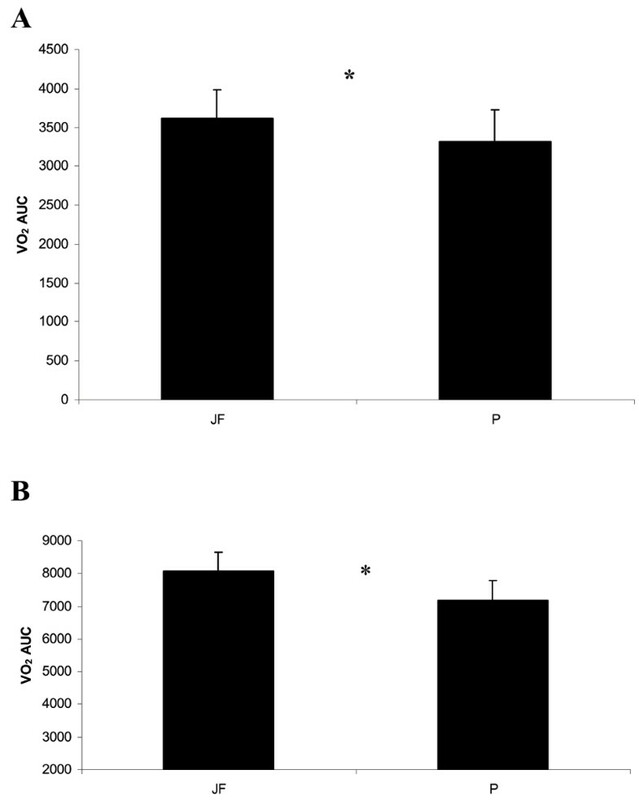 However, seven of the ten subjects were considered responders to JF (had a higher AUC for VO2during JF than P). Statistical analysis showed the difference between JF and P (12%) to be significantly different in these responders. In addition, the average systolic BP was higher (p < 0.05) in JF (118 ± 7 mmHg) than P (115 ± 8 mmHg) in both the total sample and the subgroup of responders. No differences in average HR and average diastolic BP were observed between JF and P in both the total sample and the subgroup of responders. It appears that consuming a nutritionally-enriched coffee beverage may increase resting energy expenditure in individuals that are sensitive to the caffeine and herbal coffee supplement. In addition, this supplement also appears to affect cardiovascular dynamics by augmenting systolic arterial blood pressure. Caffeine supplementation has been suggested to enhance lipolysis, fat oxidation and reduce glycogen breakdown [1, 2]. However, when caffeine is combined with a herbal supplement the combination appears to be more effective for enhancing metabolic rates than consuming caffeine alone [3, 4]. Most studies have examined the combination of caffeine with ephedra and have shown that this combination will significantly increase resting metabolic rates and promote weight and body fat loss [5–8]. Recently, allegations of adverse events associated with ephedra resulted in the temporary withdrawal of these products from the supplement market. As a result a need developed for alternative therapeutic means to combat obesity. Citrus aurantium, a fruit commonly known as "bitter orange", is commonly used as an Asian herbal medicine to treat digestive problems . However, it is also a mild stimulant and is thought to contribute to appetite suppression, increased metabolic rate and lipolysis . Citrus aurantium contains synephrine a sympathomimetic agent which has been suggested to stimulate specific adrenergic receptors (β-3, but not β-1, 2 or α-1) that stimulate fat metabolism without any of the negative side effects generally associated with compounds that stimulate the other adrenergic receptors . Recent research has suggested that citrus aurantium by itself may not be an effective weight loss supplement , and may need to be combined with other herbal products. Recently, a new brand of coffee (JavaFit™, Javalution Coffee Co., Inc.) containing caffeine combined with several mineral and herbal ingredients including citrus aurantium, garcinia cambogia, and chromium polynicotinate has been marketed as a weight loss supplement that can stimulate a greater thermogenic effect (increasing caloric expenditure) than regular commercial caffeinated coffee. The combination of mineral and herbal ingredients within this nutritionally enriched coffee is thought to provide an additive effect to caffeine alone. Chromium, an essential trace mineral that helps the body maintain normal blood sugar levels by enhancing insulin sensitivity, has also been shown to increase fat loss and increase lean muscle tissue accruement[12, 13]. To assist in absorption chromium is often combined with a vitamin or amino acid (like niacin in polynicotinate versions). Garcinia cambogia is a herb found in a fruit native to India and Southeast Asia. It has been suggested to be a natural weight loss aid primarily due to its extract, a substance called hydroxycitric acid (HCA) which is related to the citric acid found in grapefruits and oranges. Studies in animals have shown that HCA can block the conversion of sugars to fats[14, 15]. It has also been shown to raise serotonin levels in the brain, which can suppress appetite. Although some studies have been unable to show any benefit for weight loss in overweight adults taking HCA, the majority of studies have demonstrated that HCA is efficacious in enhancing weight loss in adults[18, 19]. Garcinia cambogia intake is generally seen in combination with other herbal products and compounds such as chromium. There are no studies currently known that have examined the thermogenic effect of this combination of caffeine, mineral and herbal mix in a coffee supplement. Thus, the primary purpose of this study was to examine the resting metabolic rate over a 3 hour period following ingestion of 1.5 cups of JavaFit™ Coffee versus a commercial brand caffeinated coffee in a physically active, college-aged population. In addition, cardiovascular responses and mood states were examined. Ten physically active subjects (8 male, 2 female; age 20.9 ± 1.7 y; height 178.1 ± 10.4 cm; body mass 71.8 ± 12.1 kg; VO2max 51.9 ± 8.7 ml·kg·min-1) volunteered for this study. Following an explanation of all procedures, risks, and benefits associated with the experimental protocol, each subject gave his or her written informed consent to participate in this study. The Institutional Review Board of The College of New Jersey approved the research protocol. All subjects were required to be habitual coffee drinkers that consumed between 2–3 cups of coffee daily. Subjects who were pregnant, smokers or taking regular medication except birth control pills were excluded from the study. Subjects with any known metabolic or cardiovascular disease, or psychiatric disorder were also excluded. All subjects underwent a medical screening that included medical history, physical exam and electrocardiogram. Subjects were also required to have been free of any nutritional supplements or ergogenic aids for the 6 weeks preceding the study, and were asked to refrain from taking any additional supplement during the duration of the study. Subjects reported to the Human Performance Laboratory on two separate days at the same time of day. Each testing session was separated by an average of 4 days (4.3 ± 3.2 d). Subjects were instructed to refrain from consuming any caffeine products on the day of each testing session and from performing any strenuous physical activity for the previous 12 hours. In addition, subjects were instructed to be at least 3 hours post-absorptive state prior to each trial. Following a 30 min resting period subjects were randomly provided either the nutritionally enriched JavaFit™ coffee (JF), which consisted of 450 mg of caffeine, 1200 mg of garcinia cambogia (50% hydroxycitric acid), 360 mg of citrus aurantium extract (6% synephrine alkaloid), and 225 mcg of chromium polynicotinate, or the placebo (P) which was a commercially available caffeinated coffee. The study followed a double-blind format. Coffee was prepared by weighing out 15.6 g of either coffee and brewing it with 532 ml of water using a standard commercial coffee brewer. Subjects were required to consume 1.5 cups (354 ml) of the coffee within 10–15 minutes. Subjects were not permitted to add any sweetener or cream to the coffee. Immediately following coffee consumption subjects were fitted with a two-way T-shaped breathing valve (2700 series, Hans Rudolph, Inc, Kansas City, MO) to measure oxygen consumption (VO2) and respiratory exchange ratio (RER) through open-circuit spirometry using a metabolic measurement cart (2900 SensorMedics, Yorba Linda, CA) sampling every 20-s. Machine calibration was performed prior to each session. Measures were obtained one minute following coffee consumption, every 5 min for the first 30 min, and every 10 min thereafter until 180 min post consumption. Heart rate (HR) was also measured at these time points using a wireless HR monitor (Pacer, Polar CIC, Inc., Port Washington, NY), which updated HR display every 5 s. Blood pressure (BP) was measured using a sphygmomanometer and ausculatory method at 15 min and 30 min post coffee consumption, and then for every 30 min until data collection concluded. The profile of mood states (POMS) was administered seven times during each testing session. The initial POMS administration was given as the subject reported to the Human Laboratory, and every half hour for the three hour period following coffee consumption. All questionnaires were performed under controlled conditions (a quiet room alone with the investigator) and the same researcher performed all test administrations. The POMS consists of 65 words or phrases in a Likert format questionnaire which provides measures of specific mood states. It provides measures of tension, depression, anger, vigor, fatigue and confusion. A total mood score is computed by subtracting vigor from the sum of the five other negative measures and adding 100 to avoid a negative result. McNair et al. has reported internal consistency of measures ranging between 0.85 to 0.95 and test-retest reliability estimates ranging between 0.65 to 0.74. These lower coefficients of stability are thought to be indicative of transient and fluctuating characteristics of mood states. During all test administrations participants were asked to describe their feelings upon how they were feeling at that moment. Subjects were also instructed to assess their appetite and the palatability of the coffee using a 10 cm visual analog scale (VAS). The reliability and validity of these questions to assess appetite and palatability has been previously established . The VAS was assessed 15 minutes following coffee consumption and subjects were asked to assess how they feel at that time with words anchored at each end of the VAS that expresses the most positive and most negative rating. The area under curve (AUC) for VO2 was calculated by using a standard trapezoidal technique. RER, HR, BP and POMS were averaged over the 180-minute period. Paired student's T-tests were used to analyze all data. A criterion alpha level of p ≤ 0.05 was used to determine statistical significance. All data are reported as mean ± SD. Initial AUC analysis for resting metabolic rates following coffee consumption showed a 5% difference (p = 0.21) between JF and P. However, upon closer examination of the individual results, seven of the ten subjects had higher metabolic rates during the JF trial compared to P. When the three subjects who did not respond to the trial coffee were removed from the analysis and a separate analysis was conducted on the responders, a significant difference (p < 0.05) in AUC for both 1 hr and 3 hr metabolic rates were observed (Figure 1a and 1b, respectively). Area Under the Curve (AUC) Analysis for (A) 1-Hour and (B) 3-Hour Post-Exercise Oxygen Consumption Following Coffee Consumption in Responders. * = JF significantly (p < 0.05) different than P. Data are reported mean ± SD. The average RER for each hour can be seen in Figure 2. A significant difference (p < 0.05) was seen between JF (0.87 ± 0.04) and P (0.82 ± 0.07) in the average RER for all subjects and in the responders during the first hour following coffee consumption. However, no further differences in the average RER were seen between JF and P during the second and third hours post coffee consumption. Average Hourly Respiratory Exchange Ratio. * = JF significantly (p < 0.05) different than P. Data are reported mean ± SD. Average systolic and diastolic BP responses for the three hour period and for each hour can be seen in Figure 3. The average systolic BP was significantly higher (p < 0.05) in JF (118 ± 7 mmHg) than P (115 ± 8 mmHg) in both the total sample and the subgroup of responders. A significant difference (p < 0.05) in diastolic blood pressure was seen at hour 2 between JF and P. However, no difference in the average diastolic BP for the three hour period was observed between JF and P in both the total sample and the subgroup of responders. In addition, no differences between the groups were seen in the average HR for the three hour period following coffee consumption. A 3-Hour Average and Average Hourly Systolic Blood Pressure. 3B: 3-Hour Average and Average Hourly Diastolic Blood Pressure. BP = blood pressure. * = JF significantly (p < 0.05) different than P. Data are reported mean ± SD. 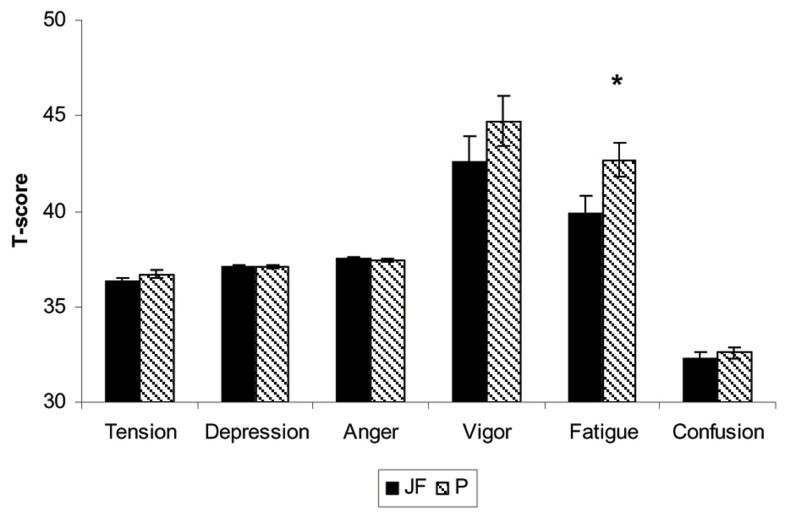 The mood scores seen in this study resembled a normal 'iceberg profile' for both JF and P suggesting that subjects were in a normal mood during coffee ingestion (see Figure 4). No significant differences were seen in the average score for the mood states tension, depression, anger, vigor, and confusion. However, a significantly lower average fatigue score was observed during JF compared to P. No difference was seen in the total mood score between JF and P. In addition, no differences between JF and P were seen in either appetite or in palatability scores (see Table 1). Average Standardized Scores (T Scores) of each Mood Trait during Profile of Mood States Administration. * = JF significantly (p < 0.05) different than P. Data are reported mean ± SD. How satisfied to you feel? How much to do you think you eat? Would you like to eat something sweet? Would you like to eat something salty? Would you like to eat something savoury? Would you like to eat something fatty? JF = JavaFit™; P = Placebo. All data are reported as mean ± SD. The results of this study suggest that a nutritionally enriched coffee containing caffeine, citrus aurantium, garcinia cambogia and chromium polynicotinate significantly increases metabolic rate and elevates systolic blood pressure in healthy, normotensive young college students. However, the increases in metabolic rate appears to occur only in those subjects (70%) sensitive to the caffeine and herbal combination found in this coffee. The notion of individual variability in nutritional supplementation has been documented in a number of other studies [22–24], and the percentage of subjects observed as responders in this study is similar to what has previously been reported. Acute caffeine and herbal supplementation has been shown to increase resting metabolic rates for up to two hours following supplementation [4, 6]. These effects have been shown in supplements combining caffeine with ephedra and black tea. Although a caffeine and citrus aurantium combination has been demonstrated to be efficacious in a weight loss program , this is the first study to examine the metabolic effect from an acute ingestion of this caffeine and herbal combination. This study is the first to demonstrate a greater metabolic effect from this caffeine and herbal supplementation compared to regular caffeinated coffee, albeit in those subjects that were determined to be responders. Considering that previous research has indicated both HCA and chromium were unable to enhance resting metabolic rates [13, 26], the enhanced thermogenic effect seen in this study is likely the result of the caffeine and citrus aurantium combination. 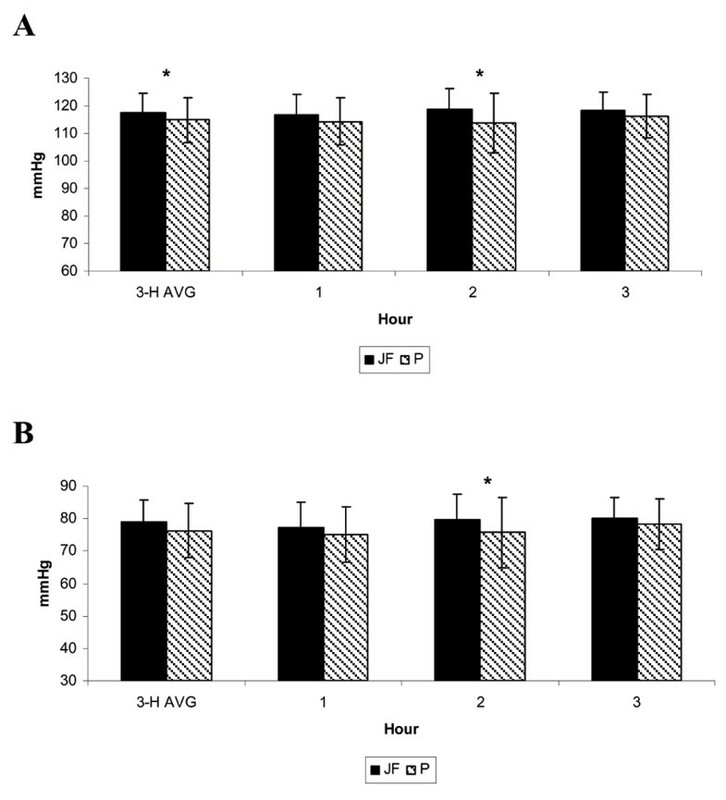 The average RER was significantly higher during the first hour of measurement in JF compared to P, indicating that fat oxidation may have been higher during P than JF. These results are in contrast to those shown previously in supplements containing HCA and/or caffeine [3, 4, 26, 27]. Although it is difficult to explain these results, it is likely that the mode of supplement ingestion (e.g. coffee) may have contributed to the unexpected outcome. Previous research has indicated that although no differences were seen in the bioavailability of caffeine whether consumed from coffee or when ingested anhydrously, it does appear that some compound within coffee limits caffeine's biological effect [28, 29]. In addition, Mougios and colleagues  demonstrated that coffee ingestion may stimulate lipolysis, however the degree of the lipolytic response was still lower than that generally seen from an anhydrous form of caffeine ingestion. The elevated systolic blood pressure seen in this study is similar to those shown in other studies examining weight loss supplements containing adrenergic amines [7, 8, 11]. Synephrine, a known active component of citrus aurantium is thought to interact with β-3 receptors to increase lipolysis and minimize the cardiovascular effect typical of adrenergic amines . Although synephrine has been shown to stimulate peripheral α-1 receptors resulting in vasoconstriction and elevations in blood pressure , other research has shown that when citrus aurantium is ingested alone no effect on blood pressure is seen . However, only when it is ingested in combination with another product containing other active herbal ingredients does it appear to elevate blood pressure . Caffeine is an adrenergic stimulant that is known to increase blood pressure , and in combination with synephrine appears to elicit a significantly higher blood pressure response . Although the placebo coffee used in this study contained caffeine, the 150 mg higher caffeine dose found in JavaFit™ in combination with synephrine likely contributed to the modest 3 mmHg average increase in systolic blood pressure. Future research should determine if these pressor effects are attenuated with repeated administration. The significantly lower fatigue exhibited in the average mood scores reported by JF compared to P is consistent with previous studies examining caffeine ingestion [33, 34]. Generally, improved fatigue accompanying caffeine intake is often seen in subjects that are sleep or rest deprived. This study indicates that even in relatively rested individuals the caffeine and herbal combination may positively affect fatigue rates as assessed by POMS. No significant differences in appetite or palatability were seen between JF and P indicating that regarding satiation, fullness and appearance the two coffees appeared similar. The results of this study indicate that consuming a nutritionally enriched coffee may provide enhanced metabolic rates in individuals that are sensitive (responders) to this caffeine and herbal combination. In addition, elevations in blood pressure shown in this study indicate that individuals with hypertension or known heart disease are strongly encouraged to consult with their physicians prior to use of this product. Authors would like to thank Dr. Richard Levandowski, Eric Breitbart, Ronald Lubischer, Ryan Ross and Greg Silvesti for their assistance in this study, as well as a group of dedicated subjects. This study was supported from a grant from Javalution Coffee Co.